When our children go screaming to time-out, we lose a sense of connection because isolation, punishment, and fear don’t work. They don’t encourage our children to be compassionate and confident. They don’t connect us to our children. In the long run, they don’t curb defiant behavior. And they just don’t feel good. Why do we do it then? Maybe we experienced punitive punishment growing up. Maybe we are tired and already at a “boiling point.” Maybe no one ever told us there are simple alternatives that not only connect us to our children but also can prevent these stressed-out times from happening. Here’s where mindfulness and mindful parenting can help. 1. Get a hold of yourself first. The number one way to defuse a situation is to manage your own emotions first. When you are mindful of what’s going on inside of you, you are better able to respond to your child instead of react. The instant you realize that you are going into “stress mode” and the part of your brain that prepares you for “fight or flight” is starting to take over, put one hand on your belly and exhale to a count of six. Don’t worry about getting a deep inhale. Your exhales and inhales will synchronize. This sends a signal to your brain to stop sending out all those stress hormones and move out of “fight or flight.” Once you calm down, you have access to the part of your brain that is used for rational decision-making. 3. Do something funny. Laughter is a release, gets us out of “fight or flight,” and reconnects us. It’s not about making fun of your child or using sarcasm. It’s about being silly, taking yourself less seriously, and de-stressing a tense situation. Try laying down on the floor and just start rolling around. Or sit down and start “pretend” meditating, chanting “Om”. Or even just start making animal noises. It’s hilarious and can get the two of you laughing…together. 4. Take a parent time-out. Instead of sending away your child, you walk away. Say, “I’m really upset right now and I need to cool down.” Go into the bathroom or your room. Besides the bonus of calming you down, taking your own time-out models self-regulation and appropriate self-care to your child. 5. Call a re-do. The second you become mindful that things are going south, say, “Wait a second. I see we aren’t connecting. Let’s start over.” This takes the blame off of any one person and focuses on the two of you reconnecting. Teaching your child to call for a re-do empowers them to be mindful of when they need to reconnect to you. 6. Give lots of time-in. Little doses of focused, undivided attention with loving eye contact and a caring tone of voice throughout the day fill your child’s need for your presence, embrace, and unconditional love. When you are feeding your toddler, pause for a moment, look her in the eyes, and say, “I love you.” When your young child gets home from school, stop what you are doing, look him in the eyes, and say, “Hi son. It’s good to see you.” No toy, activity, or privilege is worth more to a child than a parent’s loving regard. These simple mindful techniques can reconnect you to your child, lighten up stressful situations, and curb defiant behavior. See how they can support the sweet, nourishing relationship you have with your child. Notice how they can wake you up, ground you, and connect you to your own heart and to your child. Lisa A. McCrohan, MA, LCSW-C, RYT is a psychotherapist, yoga and mindfulness teacher, and mom to two little ones. Her specialty is fusing Western psychology and neurobiology with Buddhist mindfulness techniques, a body-centered approach, and yoga movement. She works with adults in her private practice at Ananda Shala and with Spanish-speaking clients at Catholic Charities in Frederick, MD. Her passion is helping clients notice the gems in their everyday lives, discover what delights their hearts, and share it all with their families and communities. For more information see www.barefootbarn.com or contact Lisa at 240-422-7380. I am curious what you would recommend for an aggressive offense. I have three young sons and while they get along really well most of the time – they have their moments. If one of my boys were to hit or shove his brother, I have a hard time believing that he shouldn’t receive some form of consequence for that behavior. Hugging him, turning things into a joke or leaving them to enjoy themselves while I take a parent time-out seems like an injustice to the child who was struck. In social situations that can be overstimulating or at times when the energy level is getting out of hand, I think it can be really helpful to give a child some quiet time alone to calm down. We don’t ever shut our boys away and tell them they can’t come out of their room, but there are plenty of times I will sit them on their bed and tell them they need to take some quiet time and when they are ready to come back out, they are welcome to join us. I LOVE the sit down idea Amy. I am wondering about situations where aggressive actions abound. Children who hit/shove/bite – I am wondering if those are the situations you are talking about? It seems counter productive to ignore (laugh, roll on the floor or leave the room) those actions that are crying out for attention. Autumn, this is the issue with have with my son, he can be aggressive, we are really at the end ideas as to how to deal with them. It’s gotten very bad. I was totally against time outs and do not like them, I feel much the way that is talked about here, but we feel we have to do something. I don’t think they are effective at all in our case. I really want to find a better way, I just don’t know how or where to find it, or start. If a child is hitting, kicking….what do you do??? 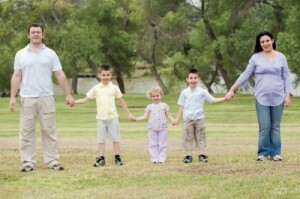 Another resource that my be helpful is Aletha Solter’s Tears and Tantrums – http://www.awareparenting.com/articles.htm. I really like – get lots of time in. I find that my toddler typically misbehaves when he wants my attention or has gotten bored with free play and needs a structured activity. If the child is kicking or hitting something or another person and is a repeat offender of this behavior, what works for us is to have a designated punching bag, bean bag etc. that is safe to hit. If the situation is unsafe, Remove the child gently suggesting ‘we don’t hit’ ‘hitting hurts people’ ‘and if you want to practice hitting you can do this over there on your own’ fewer words for the younger they are. Primarily, the parents attention should go towards the other child as acting out is often a cry for attention perhaps inadvertently. I hope that helps! My child considers my time out to be more traumatic than her own time out. If I need a break before I explode and start yelling, I simply cannot get one without escalating the problem with my daughter who considers herself abandoned either way. I have an extremely spirited, strong willed child who simply doesn’t respond to anything but “the hard way.” But the constant backtalk and aggression are not acceptable, and hugs and “time in” aren’t cutting it at all. What does positive discipline have to offer to the strong-willed, oppositional or defiant child who simply won’t quit until physical intervention is made? You might appreciate Dulce’s article on gentle discipline and the strong-willed child: http://naturalparentsnetwork.com/gentle-discipline-strong-willed-child/ I found it very helpful. I mentioned this above, Dawn: http://presenceparenting.com/the-sit-down/ It may be a starting point in those rough moments, along with this for you to be grounded in a softer, yet clear approach: http://presenceparenting.com/simple-meditation/. I have a very, very strong-willed little boy (he’s 3) and we are dealing with the backtalk and aggression right now. The biggest help for me on my road to being a gentle parent and practicing gentle discipline is my mentality. Obviously I want my child to learn the appropriate/socially acceptable way to speak to others (including parents) but I realize what he’s doing is age appropriate and he’s trying to express his displeasure with something. I just gently remind him how we speak to each other while acknowledging that he’s frustrated. Acknowledging his feelings and giving them validation helps him a lot. Most things, to me, including the backtalk and aggression are not worth the battle and power struggle. It’s not something I *HAVE* to win. Instead I view it as an ongoing lesson I’m teaching my son about respecting others and learning how to treat others. When I take the “battle mentality” out of the equation, it’s much easier for me to practice gentle discipline with my child. For me, remembering “This is not about winning or losing” helps me relax, it helps the situation defuse and we can communicate more effectively. Easier said than done (I know!!!) at times but making that transition out of “battle mentality” has been the BIGGEST help in our gentle discipline journey. Dawn, your situation sounds much like those I’ve encountered with my own children, particularly my daughter. It’s been a continual – CONTINUAL – learning process for me; one which involves revisiting my own childhood. Which is uncomfortable. I know that for myself, I often require a time out/distance/quiet in order to collect myself and present a calm solution. However, when you have an aggressive or strong willed child following you or demanding attention – NOW, it makes that all the more difficult. I can say from experience, that ramping up your response – “taking charge” or “being the boss” or “proving a point” or “not letting them get away with it” or using force – in words or physicality – NEVER results in a strong-willed child backing down. At least, it never has in my experience. It’s like when you push (I mean figuratively), they push back – HARDER. They feed off of your energy, and throw it back with more energy. So, stop pushing. The spirited child won’t back down, and won’t accept any input, until they aren’t being forced anymore. Don’t force it. But it’s really hard to stop pushing when you, yourself, the parent, the one in charge, is being pushed. But you CAN do, you MUST do it, because you are SHOWING them how you want THEM to behave. 1) Understand and accept that the message you want to get through to them (that it’s not acceptable to hit or yell or whatever) can STILL be conveyed, and will actually be received, AFTER everyone is calm. Keep that end goal in mind, but don’t make it the key. CALMING and CONNECTING are the first steps, then discussing the behavior. 2) Trust that they WILL know the right ways to act and they WANT to know the right ways to act, they just haven’t gotten there yet – they are still NEW to this world. Even when they are 5 or 8 or 12. There’s so much naivte and so much they don’t understand yet. They WILL learn it. Have faith. 3) Be the change you want to see in them. If you want them to stop yelling in that moment, stop yelling. If you want them to stop stomping, stop moving your own body around. If you want them to breathe deeply, just start doing it yourself. Picture them as babies. Just stop what you’re doing, turn off their words, and think of them as little tiny ones. They may not WANT held, but you can offer it. You may not give milk anymore, but you can offer comfort and gentle touch. You wouldn’t yell at a baby who was screaming. Keep that in your mind. I know with a defiant/strong willed child it can FEEL like you have no choice but to be physical, but you DO have a choice. They eventually they WILL calm down. Think about how you want to feel when you’re all calm. Make choices towards feeling good (not guilty or shamed or angry) once calm has descended. THEN you can address aggression or backtalk, or whatever behavior is undesirable. I have experience with a strong willed child, also. I can attest that as Kelley stated, the strong willed child learns best after they are calm, rather than going head to head in the moment. Once the situation is finished and everyone has calmed back down and the anger and force is gone, he is reasonable again and can either discuss a solution, or listen to my point of view. Because he is bright and rational and wants to be ‘good,’ talking is often all it takes for him to learn or to be more considerate. I still have to repeat myself, but after the initial learning period, all it takes is a reminder and then he will cooperate. Mostly. =P Of course, this method works best with very verbal children. Little tots, not so much. They do better with the hugs and with being picked up and moved to a different location for a cooling off period, or a ‘time in’ or a distraction. However, there are still some moments where in the moment my strong willed kid gets caught up in things and is just plain rude or defiant, and it really drives me wild. Staying quiet and calm gets lost in the wild fray (I have 3 boys and a VERY loud, active little girl). I have what I call my Boy Mom Voice, and I save it for those occasions where I need to get through, and calm talk or reminders aren’t working. My kids aren’t *afraid* of the Boy Mom Voice, but they know I mean business when I pull it out. It means Someone’s Body, Emotions, or Personal Item is being disrespected and we are all going to pay attention. NOW. I really like this book for spirited children http://www.amazon.ca/Raising-Your-Spirited-Child-Perceptive/dp/0060923288 it has tips and evaluation tools for kids and parents. It’s pretty good! I know that sometimes if I’m dealing with repeat offences with my strong willed kid, I will sit down and ask them (in a calm and rational moment, not when they are exerting their will and/or are upset, or we are in conflict): I want xyz to happen. Here is why. What do YOU think is a good idea for how we can get you to do this? Also effective with the very verbal child, and not so much with the non verbal or early verbal stage. Positive feedback is always pretty good, too. Noticing when my son is helpful or cooperative and either thanking him, hugging him, ruffling his hair, or (if he’s gone out of his way or been uncharacteristically cooperative) randomly giving him a bonus treat like staying up a half hour later, or playing a game he likes, helps make him feel like I notice when he makes an effort to be responsible or cooperative. It’s nice to feel like people we care about notice when we make an effort. Same with my kids. I know there is a ‘no rewards’ parenting philosophy out there, and I respect that. I think yes, you can go overboard. But positive feedback and special treats aren’t uncalled for, in my personal opinion. I use those a lot. It’s great to be positive, I think. So long as they don’t grow to depend on praise, I think it’s just fine. If i come home from work to find that my 8 year old has drawn on the tv with a sharpie, you can bet i wont “give them a hug” or “have a do-over.” There is nothing wrong with time outs. First we are told spankings are evil and the worst thing we can do to a child, now time outs are bad… Why don’t we just let them do whatever they want whenever they want. I can relate to your frustration. I shared an article above that talks in detail about different approaches to discipline (http://presenceparenting.com/ways-to-discipline-a-child/). Ultimately we each get to choose what works for us and our children. One question that comes to mind is, how do we want our approach to work? What do we *really* want to teach? The alternatives listed are not intended to shift power; they enter a whole different approach to the parent-child relationship where power isn’t either or – it’s shared. We can actually share power with our kids and experience power as individuals – the power to choose. We choose how we teach, they get to learn how their choices affect their experience of life. I think what we are trying to say (without speaking for the author) is that we can teach without being the heavy. Sure, there’s lots of punishment in the “real world”, but that is not the only way people learn and such an approach has wide ranging effects – some of which we may not really intend. I definitely do want my children to be in control – of themselves! They can’t do that if I am threatening them and trying to control them. Instead, I talk to my children, I spend time with them, I model behavior, and in the end, they make the choices. They *choose* to act respectfully because they have been treated respectfully, because their needs are being met and they aren’t acting out trying to get those needs met, because they see that life is more peaceful and fun when we all work together. Helping children learn self-discipline doesn’t require punishment. It just requires active, respectful parenting the exact behaviors we would like to see from our children. Too bad that doesn’t work with every child. We have “House Rules” which have consequences and rewards on it for various behavior. For example, refusing to keep your room clean all week means you don’t get to watch a movie on Friday night. That method works for my family and no one has the right to tell me I am wrong. Children do not have the world knowledge to be in control of the choices they make with out facing the consequences of their actions. Modeling good behavior is all well and good but not all children are the same, what works for you will not work for all.